‘Do you hear what I hear?’ sang the choir of almost 300 children at the Hull Schools’ Festival of Carols at the City Hall on Monday evening. Hull’s Lord Mayor, Councillor Pete Allen, opened the proceedings by welcoming 19 of the city’s primary schools who then went on to entertain an almost capacity audience with a selection of Christmas songs both old and new. The ever popular and traditional nativity drama was, this year, performed by pupils from Francis Askew Primary School. 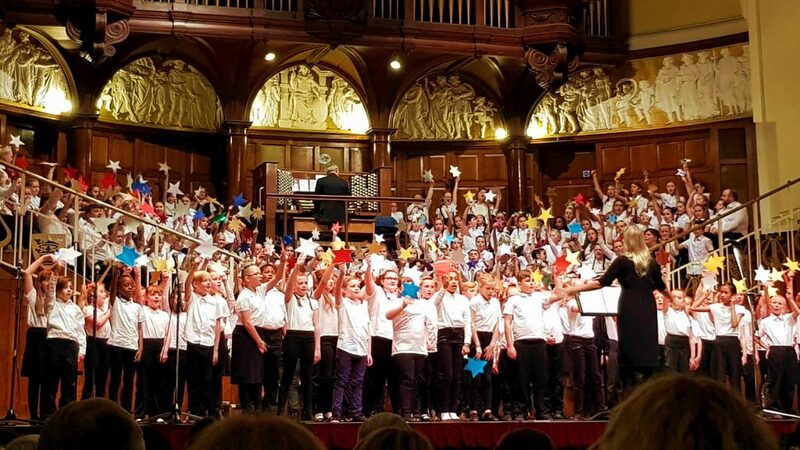 The festival, led by musical director Caroline King, accompanist Laurence Rugg, and organist Mark Keith, has been taking place annually for over 60 years and, judging by Monday night’s highly successful performance, is set to continue for many years to come. 3 Comments on "Do You Hear What I Hear?" Congratulations to the children and staff who gave us a splendid evening on Monday. Feedback from children and audience alike has been positively glowing! It was, once again, an honour and a pleasure to be involved. We really do have great children in this city – and very nice, supportive mums and dads too! Hull & Proud doesn’t just apply to rugby teams. Is it true that there are TWO rugby teams in Hull? Is this a new thing? Have I missed something?